Specifically designed to support enhanced hormone metabolism and detoxification pathways. 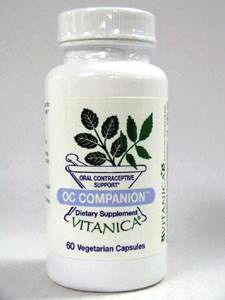 Contains nutrients complimentary for women taking oral contraceptives. These statements has not been evaluated by the Food and Drug Administration. This product is not intended to diagnose, treat, cure, or prevent any disease. Vegetarian capsule (HPMC and water) cellulose, silicon dioxide, L-Leucine. Two (2) capsules per day. Borage seed oil, bromelain and garlic may potentiate anti-coagulant/anti-platelet agents. OC Companion is suitable for vegetarians.